ADA, Minn. (May 24, 2018) – The 100th anniversary season of Norman County Raceway is off and running. The great crowd on hand was treated to race teams from all over the tri-state region Thursday, who flocked to the high-banked three-eighths-mile oval for opening night. The night was highlighted by the running of the inaugural Dakota Cat Modified Shootout. A stout field of 16 IMCA Modifieds were checked in. Michael Greseth and Dev Malmlov led the field to the green flag. On the initial start, Malmlov entered turn one too high and slid off the embankment, bringing out the caution. As a result, Malmlov was sent to the tail of the field. As the race resumed, Greseth jumped out to the early lead over Billy Vogel and Modified rookie, Jesse Skalicky. Greseth quickly opened up a comfortable lead as Vogel and Skalicky battled for second. At the midway point, Vogel and Skalicky’s battle turned into a fight for third as Austin Arneson drove by both of them. Arneson then set his sights on Greseth, who was enjoying a full straightaway lead. Arneson searched all over the racing surface but didn’t have enough speed to reel in Greseth. Greseth cruised to the win, which was his first at NCR since July 21st, 2007 and 16th overall. 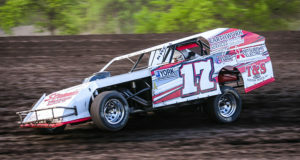 Ada’s own Andy Wagner picked up the IMCA SportMod feature. Wagner, who is coming into 2018 as the defending track champion, picked up where he left off last season leading Thursday’s feature wire to wire. Luke Johnson, who started sixth, and Aaron Wetterlin, who started 10th, moved into second and third respectively, but couldn’t run down Wagner. Wagner went on to visit KRJB 106.5FM Victory Lane by a margin of eight car lengths. The WISSOTA Midwest Modified feature was stacked with former national and track champions throughout the field. Dustin Strand grabbed the early lead with Lance Schill and Brock Gronwold in tow. Strand ran a smooth line around the low side of the speedway, while Schill drove his No. 17 machine deep into the corners. Schill reached the back bumper of Strand once in turns three and four, making slight contact, but that’s as close as he would get to Strand. Strand went on to claim his 23rd career Midwest Mod win and 34th win overall at NCR. Tim Shiek led from green to checkers to take the IMCA Hobby Stock feature win. Rob VanMil picked up the IMCA Stock Car feature win. Rick Schulz held the lead in the opening laps with VanMil hot on his heels. It only took one slight slip by Schulz for VanMil to capitalize on. Schulz’s right rear tire dipped off the banking in turn one, which was all that VanMil needed to get by and take the lead. Once out front, VanMil pulled away to take the win. Racing continues next Thursday, May 31st at Norman County Raceway with the fan-favorite Meet N Greet night. During intermission, all the drivers will bring their cars on the front straightaway and fans will be able to walk down, meet their favorite drivers, get autographs and take pictures. Green flag drops at 7 pm.